This is the most complete and comprehensive manual of its kind written for framers and photographers in print today. Designed as a technical reference book geared to both beginners and seasoned veterans alike, it is a complete source for basic techniques, hands-on procedures, applications and tips. 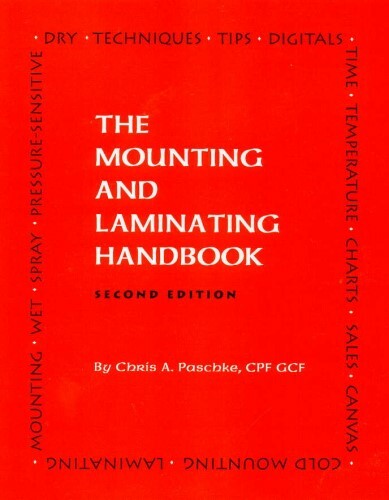 Broken into understandable chapters, it covers TTPM; adhesives, materials, substrates; wet, spray, and pressure-sensitive adhesives; dry mounting, cold mounting AND laminating. Learning the basics including premounting, multiple bites, color tinting, and fabric wrapping, allows for applying them to individual framing jobs rather than specific projects while canvas transferring brings in the profit dollars. Updated information on handling digital images includes electrophotographic, electrostatic, thermal transfer, inkjet, laser, dye sublimation prints; AND identification of digital photographs. This 2002 SECOND EDITION release from Designs Ink Publishing, is a laminated, soft cover, 176 page edition, 7"x9", that retails for $19.95. Book is written in essay format, but includes bullet point step-by-step, line art, diagrams, special tips, detailed reference, contents and appendix, plus complete index and bibliography.